The year was 1994. General Motors wanted to show off its earth-friendly side. At the Los Angeles Auto Show, GM rolled out alternate-fuel vehicles, accompanied by an ersatz Barney dinosaur named Natural Gus and a fusillade of dancing girls in faux park ranger gear, albeit with hot pants. A wince-inducing song about GM's eco-crusade ("The earth is our home. Keep it clean. GM will do its best. But it's up to you to do the rest.") provided the soundtrack to dance moves ripped off from Paula Abdul, along with a break dancer. Journalists in attendance shared the clammy sweat of embarrassment, and the conviction that whoever dreamed up Natural Gus and his entourage should be fired on the spot. At the 2009 LA auto show, GM rolled out the production version of the Chevrolet Volt plug-in hybrid ... accompanied by a fusillade of dancing girls in frilly shirts and black tights. No dinosaur, but a wince-inducing song about the Volt's green crusade ("E is for electricity, V for Chevy Volt, you see. It's as simple like a dimple. Plug it in and see.") provided the soundtrack to dance moves ripped off from Paula Abdul, along with a break dancer. The "new GM"? More like that same old clammy sweat of 1994. 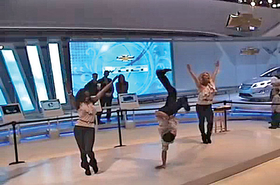 Check it out the YouTube video at autonews.com/voltdance.